﻿ OhGizmo! 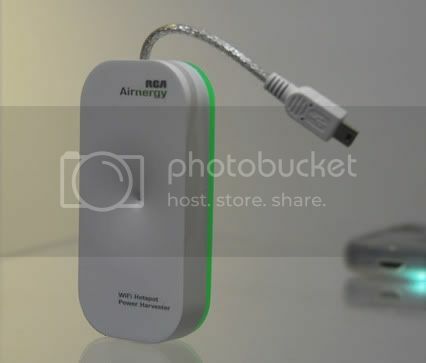 reports on a hidden gem from this year’s CES; the RCA Airnergy Charger, a product sent straight from the future that convert air to electricity. Or rather, it somehow picks up on Wi-Fi signals and uses them to charge batteries. Apparently it does this surprisingly well, charging a Blackberry from 30% to full battery in 90 minutes. If this sounds like magic then prepare to stare disbelievingly at the proposed price: $40. Expected release is sometime during the summer. This means that there is a chance that in 6 months our wireless controllers will be continuously recharged from the same invisible Wi-Fi beams that the console itself is using to connect to the internet. As the Airnergy supposedly works wherever there is a hotspot, you can literally just leave them lying around your house if you happen to have a wireless connection. Just another subtle sign that we are in fact living in the future.